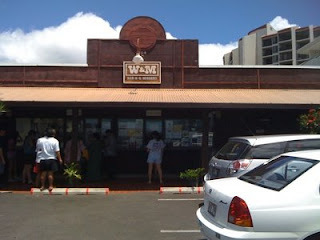 I was told that a great place to get burgers was a place I had never heard of on Waialae Avenue: W & M Bar-B-Q Burger. I heard it's ALWAYS busy, so something must be up. Today, I had to fend for myself when it came to lunch so I decided to take a little drive to Kaimuki. The parking lot was full and there was even two cars parked illegally with someone inside the car and the engine on. Unfortunately, I was by myself so I had to find a side street to park on. I was able to get a space nearby on 2nd Avenue. The hard part was trying to cross Waialae on a crosswalk with no traffic signals. Those drivers making left turns out of City Mill! 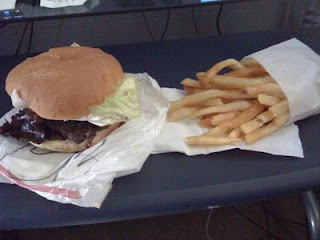 For $8.43 (tax included), I bought a Deluxe Steak Burger (no onions), french fries and a large drink. For $1.95, there wasn't much fries. I think the next time I'll pass on it. The Steak Burger consisted of thin slices of teriyaki beef. By the time I brought the burger home it was kind of cold. But, the teriyaki slices were mighty tasty and the sauce in the burger was very good. This is a case of quality over quantity. W & M had a sign that said that they had to raise their prices because of the cost of fuel. The Deluxe Steak Burger was $4.15. Overall, I was satified but not blown away. The next time, I'll try the normal Bar-B-Q Burger. Can't go tomorrow or the next day because they are closed Mondays and Tuesdays. W&M is the bomb. Your lunch looked delicious and now I can't wait to get back there. Used to be a regular stop when we lived in Kaimuki. Thanks for sharing.